If you rely on just a single camera while traveling, it’s easy to organize your photos by time and date when you get home. But most of us use multiple cameras, and smartphones, and action cams, to document our travels. So researchers at Disney and the University of Washington are working on software that can automatically put all of those shots into a perfectly ordered slideshow. It’s relatively easy for you to collate and organize your vacation photos immediately upon your return, because you can remember where you went and what you did from day to day—it’s just not a particularly fun task. And the longer you procrastinate, the more you’ll forget. But sorting your photos is a herculean task for an algorithm because it has no idea how you spent your time or where on earth your photos were snapped. 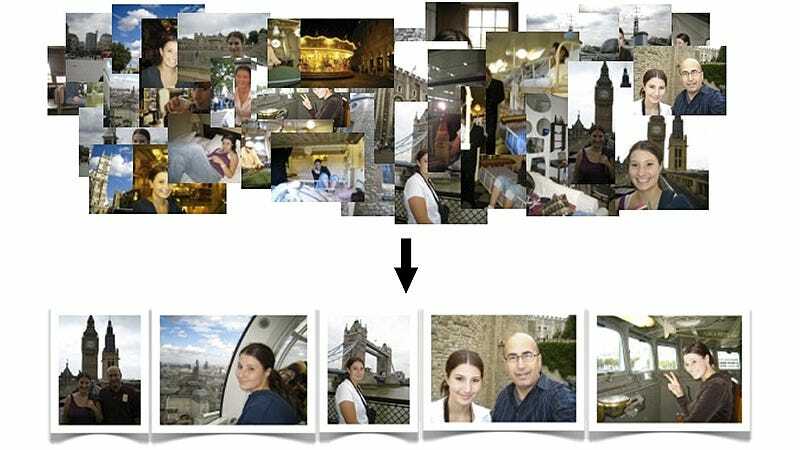 To overcome this, the software looks for countless clues hidden in each photo. Facial recognition algorithms allow it to determine who’s in a photo, and based on how the faces are lit, figure out which ones were taken around the same time. If you’re constantly snapping photos with new people you meet, this can help the software develop a timeline of your travels. There are also more obvious image recognition tricks that can be used to figure out which images belong together or when they were taken. This includes distinctive objects in the background (like a landmark) the overall color saturation (was it a sunny day or a cloudy one) and of course just duplicate images, because how often do you just take one photo at a time?